Davy’s Wine Merchants’ 150th birthday is creeping up and, having only just caught my eye, they seem to be wearing their age very well. Established in an era when deliveries arrived by horse and cart on the cobbled streets of London Town, and serving patrons through two World Wars and into the millennium, this group of 24 traditional wine bars and shops can perhaps give us all a lesson in longevity. Set up by FE Davy in 1870, we are now into the fifth generation of Davys, and the group is currently headed up by James Davy. He has been responsible for reviving the merchanting side of the business by expanding online retailing and direct sales with a focus on fine wine, adding a private cellars division and offering En Primeur, a method of purchasing wines early while they are still in the barrel. Great news if you’re a fine wine investor or have your own cellar at home, but what can the everyday patron expect from a Davy’s bar? With more places than ever to get a glass of wine in London, I wanted to discover what’s on the wine list and how does it compete with the wide offering now available in a city of modern Vinotecas and sleek venues with card operated enomatic machines and the like. I went to two Davy’s bars, Crusting Pipe and Grapeshots, to find out. Crusting Pipe is in the heart of the Old Covent Garden Market and with its vaulted ceilings and little nooks and crannies, it’s about as traditional as a wine bar can get. Despite it being in tourist central, it offers an authentic experience without the hiked up prices and with very decent drink. Quality control is one of the advantages of a centralised menu and to avoid it becoming stale, it is tweaked every couple of months. There are also six exclusive promotions a year showcasing small boutique producers – a selection of these guest wines can be found on the first page of the wine list. There will usually be a couple of premium wines available and potentially an obscure pick; Davy’s are proudly traditional and like to stick to their values, but they also like to introduce the odd challenge, like a white Bordeaux, which we start our tasting with. The Chateau Argadens Blanc 2017 is made from 65% Sauvignon Blanc and 35% Semillon, possessing a refreshing acidity with crunchy green apple and citrus fruits. It’s softened with some summer peach and apricot, and a pleasant mineral finish lends it some nice complexity. This is one of the wines from the promoted producer at the moment, Maison Sichel, a Bordeaux-based family winery, who are showcasing five wines, which also includes a declassified Margaux – a steal at £48 a bottle. Providing good value to their patrons is important to Davy’s and featuring own-label wines is one way of securing that. James Davy is passionate about working with wineries to create Davy’s own blends, which are made to suit the tastes of the brand and its loyal followers. It’s a way to offer a particular style of wine they want to sell and it also helps the smaller wineries get more exposure. Davy’s have their own-label Champagne and port, which really do deliver excellent value. Davy’s Célébration Champagne, priced at £48, is made by Gardet and it is elegant with fine bubbles and toasty brioche notes. The port (Davy’s Finest Reserve Port) is also impressive – it’s very similar to a Late Bottled Vintage, with a full-body and luscious fruit flavours. As noted shippers of port in the First World War, getting the port right would have been a task close to their hearts – and I love that it can also be served in a 500ml copper jug. Although the wine list is largely Old World focused, it is varied, with a wide selection of wines available by the glass. Crusting Pipe gets its fair share of tourists ordering the usual Sauvignon Blancs, Pinot Grigios and Malbecs, but in the bars in the City, like Grapeshots, you’re more likely to see the own-label wines being ordered; Davy’s has built a good reputation there and has nurtured relationships over decades. The clientele in the City usually consists of business people who know and love their wine and they are happy to take knowledgable recommendations from the staff. With such a great list, I ask Alex from Crusting Pipe what their customers don’t tend to order and his answer is, ‘Viognier’ – which is a shame because the Viognier Cuvée from southern France is delicious. It’s brimming with stone fruits and is lovely and full-bodied with that signature Viognier oily texture. Staying in the same full-bodied white vein, we also try Davy’s White Burgundy, which you can buy by the glass as well. We both agree it is villages quality; it’s weighty with a viscous, creamy texture and is another great example of a triumphant Davy’s label wine. We lighten things up with the Terra e Mare Vermentino di Galluria DOCG 2016 from Sardinia, which is one of the more premium whites by the glass and it certainly delivers. This wine is beautifully floral on the nose, which also comes through on the palate, alongside honeyed fruit flavours, ending with a mineral finish. Galluria is the only DOCG appellation in Sardinia and this light but complex wine is also a favourite of Alex’s at Grapeshots. It’s one that they like to recommend there and it goes down well with the punters in the City. Although the clientele are more open to suggestion at Grapeshots, there is one fantastic white that gets overlooked in favour of more well-known grape varieties, and that’s Gerwurtztraminer. I love an aromatic Gerwurtztraminer and this one is from Marlborough, New Zealand, and has the great name of Little Beauty. The winemaker used to make the famous Cloudy Bay and only 600 cases of it are produced a year, so it’s pretty special. It has notes of jasmine and orange blossom on the nose and tastes of honey and lychees – it’s gorgeous. Thoroughly impressed with the whites, we move onto reds at Crusting Pipe, which seem more at home in these cosy surroundings. We start with a light-bodied Pinot Noir – it’s the Davy’s Red Burgundy, which is usually offered first when people ask for a Pinot Noir. The other Pinot Noir on the menu is from Chile but this one is more vibrant and refined. We also try the Merlot Reserve from Cape Leonard, a South African estate with a winemaking history that spans over 300 years. At £26.50, it’s a fabulous wine – smoky, with hints of chocolate – it’s everything I want from a Merlot! At Grapeshots, Alex recommends Davy’s Claret, the go-to Bordeaux that comes in at a very reasonable £29.99. It’s definitely complex for a house Claret and I would guess that it’s Davy’s flagship wine: it’s classic, it’s refined and it’s dignified. Davy’s Rioja Reserva is another hot tip, recommended by both Alexs as one of the nicest own-labels. It’s well-integrated, not too tannic and is bursting with red and black cherry fruits, subtly laced with vanilla. I end the tasting back at Crusting Pipe looking again at the promotion wines by Maison Sichel. The Château Trioll 2014 from Corbières is a really decent wine that represents the fantastic quality of the Languedoc region without the hefty price tag that lesser wines from more prestigious regions command. It’s deeply coloured with a complexity to match – there are layers of bramble fruits, thyme and spice, with an elegant structure and a lingering finish. And finally, I get to try the declassified Margaux. It’s Cru Classe quality: the predominantly Cabernet blend expresses itself as a medley of rich, baked black fruits and the bold flavours of the wine coat the entire mouth. The grippy tannins make sure it sticks around for a long and persistent finish. My whistle-stop tour of the Davy’s wine list has left me feeling like I want to go back and explore even more. These unassuming old wine bars dotted around the city are havens of wine knowledge and passion and they offer outstanding value for money. I have discovered a brand that has stayed true to its roots and has an intricate knowledge of what their customer base wants to drink. Sure, perhaps there’s room for a few more New World offerings, but there is so much variety and quality on the list as it is, which doesn’t get the exposure it deserves because, more often than not, patrons tend to play it safe. At least now, whether I want something familiar and classic or a hidden gem that will challenge my tastes, I know I’ve got 24 spots in London that guarantee an excellent glass of wine. 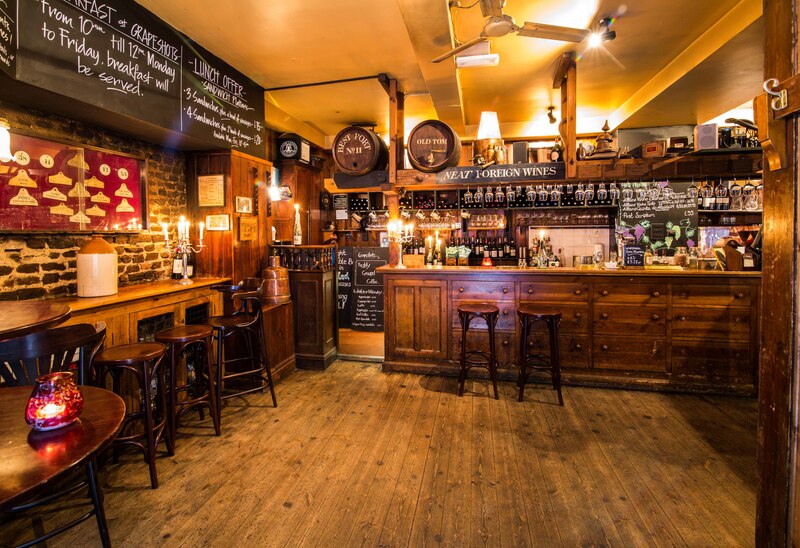 Check out Davy’s Boot & Flogger in Southwark, just down the road from London Bridge. It’s my personal favourite and it was the first real wine bar in London, opened in 1964.